Richly illustrated with photos, illustrations, and prototypes, and with a foreword by electronic music visionary Jean-Michel Jarre. It celebrates the art & science of interface design in electronic music within the mysterious link between player and machine. Meet artists Dorit Chrysler, Suzanne Ciani, Richard Devine, DiViNCi, Laura Escudé, Ean Golden, Axel Hartmann, Larry Heard, Roger Linn, Keith McMillen, Moldover, Jordan Rudess, Dave Smith, Tatsuya Takahashi, and more, along with well-known industry brands. Dive into the ideas behind gear like synths, drum machines, sequencers, DJ equipment, DAWs, and iOS apps. Explore sections on design principles, control elements, sound visualization, and concepts such as grids, MPC, multitouch, modular, and much more. 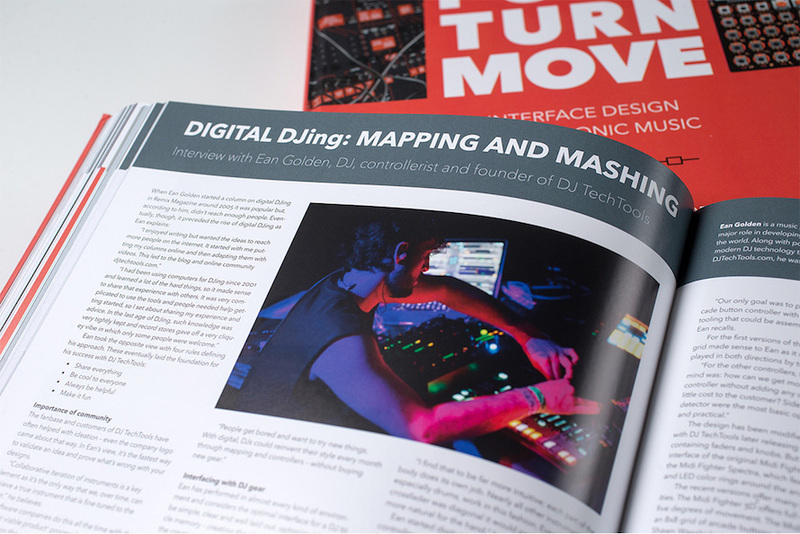 "As a DJ, producer and equipment designer, I was looking forward to getting my hands on this book. Over the years, I have designed a number of different products, but most have been lighting controls or industrial process control equipment. I was curious to get another fresh perspective on design. This book did not disappoint. The graphical design and layout is stunning with a great balance between the images and the font selections. The content is beautifully presented and gracefully formatted. It is a very comfortable read. The content spans decades of development, though it doesn't get bogged down in trying to present a historical reference of the development of the equipment, rather, it offers an opportunity to explore the various ways that the original equipment designers chose to let the user interface with the instruments. All sort and sundry of methods are looked at including the various mechanical, electrical, graphical, physical and visual. What an exceptional compilation of design information and the processes that go on behind the scenes. Back in the 70s, I had the pleasure of meeting Bob Moog at his original facility in Trumansburg, NY. This was during the early days of the company and they were just starting to roll out some of their early products. It was a fascinating visit and I will never forget how energized the place was with all of the excitement surrounding the creation of the products. In the following days, I was treated to a performance of Mother Mallard's Portable Masterpiece Company, one of the first groups to utilize some of these early synthesizers. The book is amazing, and I am sure I will pore through the pages again and again to fuel my creative juices. Kudos to the author and the entire development team. Richard Henry "
"Great book to spend an afternoon with while listening to tunes. Purchased on Clearance for $20." Sound: How is sound visualised in music soft- and hardware? Layout: How do you organise an interface for sound-creation? Get an overview of design principles and techniques for designing interfaces of electronic music instruments and controllers. Concept: How has different instrument-makers solved the challenges of visualising and controlling sound? See examples of hardware, software, apps etc. of Digital Audio Workstations, Grid-based sequencing, Modular Synthesizers, Collaborative tools, Radial, Gestural interfaces etc. User: How do you design the best possible experience for musicians? Learn about user centered interface design, usability, workflows, experience design etc. 350 pages in full color. Dimensions: 24.5 x 24.5 cm (9.6 x 9.6 inches). Printed in Denmark on 150g acid free quality paper. Ean Golden, DJ and controllerist, founder of DJ TechTools and designer of several DJ-related products. Dave Smith, Dave Smith Instruments, legendary synth-maker. Suzanne Ciani, Buchla artist and electronic music pioneer. Roger Linn, Roger Linn Design, legendary maker of the Linndrum, MPC-grid, Linnstrument and others. Keith McMillen, Keith McMillen Instruments. Jordan Rudess, Artist, Keyboard player in Dream Theater, Founder of Wizdom Music (GeoShred and other iPad apps). Richard Devine, Notable sound designer and modular artist. Olivier Gillet, Mutable Instruments (Eurorack Format Synthesizer Modules). Ableton: Gerhard Behles, CEO and Founder. Ed Macovaz, Head of Design. Jesse Terry, Push Product Owner. Brian Crabtree, Founder of Monome - iconic grid-based controllers and now also Eurorack products. Moldover, Artist and controllerist, originator of several controllers and collaborative instruments. Dorit Chrysler, Thereminist, composer, producer, and singer. Co-founder of the New York Theremin Society and America's first school for theremin. Native Instruments: Gösta Wellmer, Head of UI Design at Native Instruments and others. Skinnerbox, Electronic music makers and software designers. "I bought this book as something fun to flip through, and am amazed at its heft - there's a lot in here! It's great for spending an hour looking at gorgeous old designs, or planning your next foolish hardware purchase (Moog Theremini...). The interviews are pretty good too. 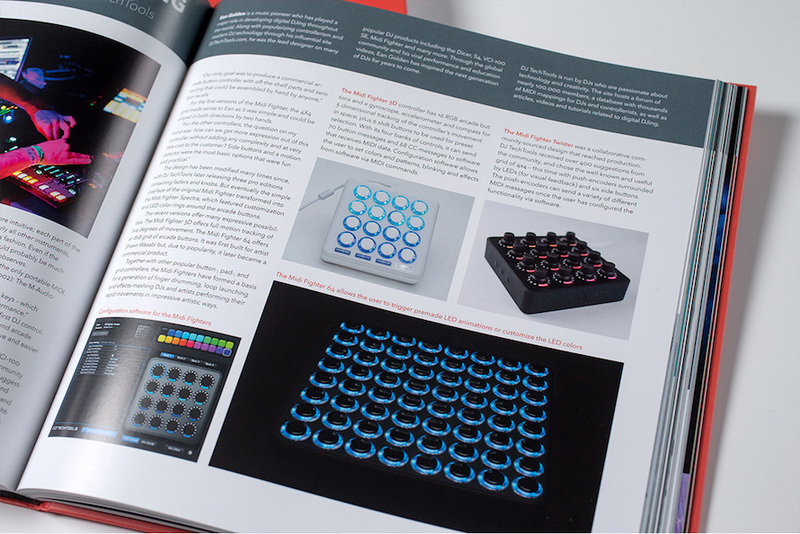 You get insight into the design processes at major hardware companies, as well as creative thinking from a number of the featured artists. It's expensive, as books go, but it feels worthy of the price tag." Is this just a coffee table book with pretty photos of gear? 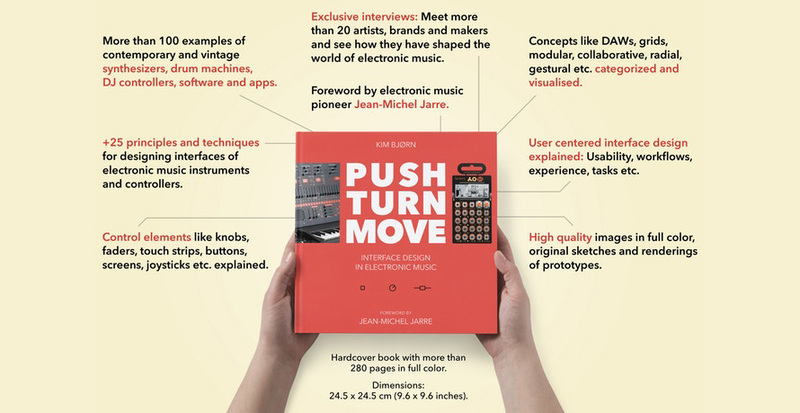 Of course we want to make a visual engaging book, however the ambition goes beyond that: The book provides a categorization of gear and explores the functional, artistic, philosophical and aesthetic world of user interfaces in the context of making and performing of electronic music. Are there reviews or manuals of gear in it? That is very well done elsewhere, we rather focus on usability and design principles. We also don’t go into detail on how the instruments sound. Why is device X or artist Y not in the book? This question is very relevant. We are lucky to have close to all major brands represented - but included quite a few smaller brands, because their creations are relevant and complementing. We would love to include all instruments but that would make the book thousands of pages, so we have had to make choices. Getting busy artists to do interviews for a book like this is not always easy, we are still working on getting even more major artists to contribute and we hope we present a varied selection. Is the book about hardware or software? It’s about both, however hardware takes up a larger part of the book than software. Again the amount of released software is astronomic so we have to focus on those having most impact on electronic music making. Will I learn how to operate my gear or software by reading this book? Not directly as in manuals, but you will definitely get a deeper understanding on why gear looks like it does and you will also get valuable insight in how design principles have developed. Is this book for musicians or designers or what? 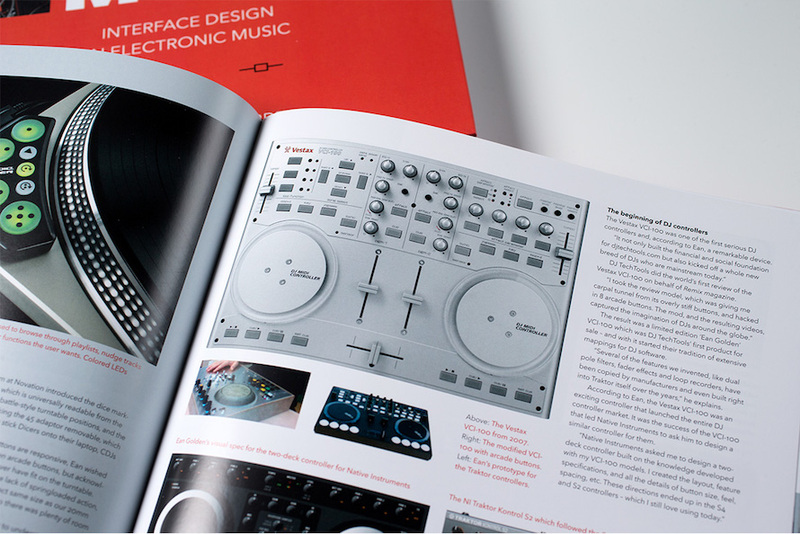 The book is for everyone interested in making electronic music and who want to get insight in how their gear is made. It would also appeal to professionals working with interaction design, usability or industrial design in general. How did you determine the price (why is it so expensive / so cheap)? That has in fact been quite difficult. On one hand we would like everyone with interest to be able to get the book, so we would love to give the book away for free if we could. On the other hand - we have been working on this book for more than a year, there has been put many hundreds of working hours into the project: Conceptualizing, researching, writing, making agreements with brands and artists, interviewing, getting pictures, finding people to help, figuring out how to print and send out the book worldwide.